Responsive, professional service through local, independent leadership. We offer our Certificate of Deposits to both our Commercial and Personal Accounts. Available as an IRA for personal accounts (Branch only). Minimum to open $1,000.00. Interest credited on the last day of the month. It’s safe, convenient, fast and FREE. Presidential customers must first sign up for Online Banking to utilize the app. Presidential Bank, FSB, was organized in 1985. Our assets exceed $500 million. Our main office is located in Bethesda, Maryland. We have branches throughout the metro DC area. 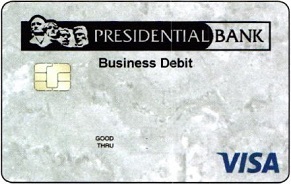 Visa® Business Debit Cards now available! Available to personal and commercial customers. Money Market Plus Checking accounts have an average daily balance requirement of $100,000.00 to earn the highest rate. Accounts that do not meet this balance requirement will earn a lower rate as disclosed on the Rate Schedule. APY (Annual Percentage Yield) for Certificates of Deposit is accurate as of August 31, 2018 and remains valid for the duration of a 60 month term. Minimum opening deposit is $1,000. Early withdrawal may result in a penalty. Annual Percentage Yield (APY) for Certificates of Deposit is accurate as of August 31, 2018 and remains valid for the duration of a 36 month term. Minimum opening deposit is $1,000. Early withdrawal may result in penalty. APY (Annual Percentage Yield) for Certificates of Deposit is accurate as of August 31, 2018 and remains valid for the duration of a 24 month term. Minimum opening deposit is $1,000. Early withdrawal may result in a penalty. Annual Percentage Yield (APY) for Certificates of Deposit is accurate as of August 31, 2018 and remains valid for the duration of a 12 month term. Minimum opening deposit is $1,000. Early withdrawal may result in penalty. Available to personal and commercial customers. Pays a 0.50% Annual Percentage Yield (APY) on balances up to $35,000, 0.25% APY on balances in excess of $35,000. * Minimum to open $5,000. Move money electronically, not by writing checks. No monthly transaction limits. No monthly service charge if you maintain a $500 minimum balance. Free Online Banking services include BillPayer, Standard External Funds Transfer, Mobile Banking and Mobile Remote Deposit Capture. Checkless Checking pays a 2.00% APY on balances up to $25,000, 1.00% APY on balances in excess of $25,000. An electronic monthly deposit of $500.00 or more from payroll, pension, social security, or annuity is required. Each account must have a unique direct deposit source. Seven (7) electronic withdrawals per month are required (electronic withdrawals include: ATM, POS, ACH and BillPayments). Accounts that do not meet the deposit or withdrawal requirements will earn a lower rate as disclosed on the Rate Schedule. Deposit and withdrawal requirements are waived for the first month the account is in this product. The posting date will be used to determine transaction qualification.